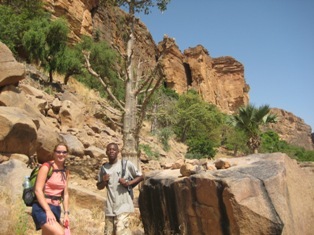 Our trip to Dogon Country on the Falaise de Bandiagara was one of the highlights of our trip so far. We had little expectation and were absolutely fascinated by what we saw. 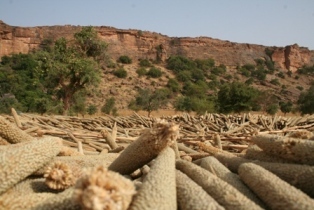 The trip started in Sevare, a gateway town to the Dogon Country. 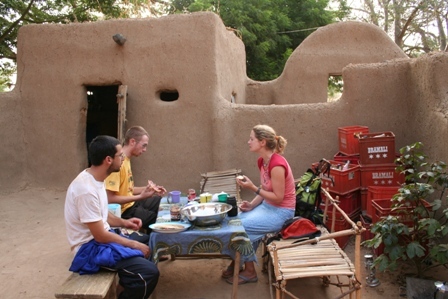 While staying in Mac’s Refuge, we sought the advice of Mac, an American Christian Missionary who grew up in the Dogon Country. A guide is necessary for the trip. We managed to avoid the stresses of negotiation by teaming up with James, a Peace Corps volunteer based in Burkina Faso, and his friend Joe. We struck a deal of 15,000 CFA per day, a good deal by all accounts. We set off (squeezed in with 5 others) in a Peugeot 504 taxi, circa 1979, with our guide Séydou, a Dogon from the village of Ende. 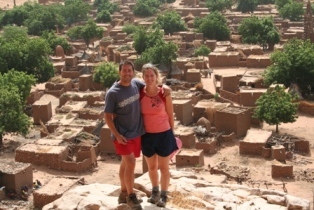 The ride took us to Bandiagara. We were glad to arrive in one piece, as the car did not inspire confidence! After a lukewarm lunch of rice and peanut sauce acompanied by some dodgy meat, served by a local lady, we drove the last 18K to Djuigibombo. 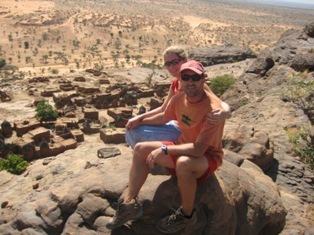 Here we got our first glimpse of a Dogon village. We were greeted by an enthousiastic bunch of kids, calling out ‘ca va’ excitedly. They quickly relieved me of my empty water bottle, and ran off. 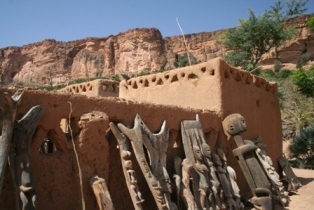 The Dogon people have lived along the Bandiagara Escarpement since the 11th century. They first build their villages into the cliffs for security and protection. 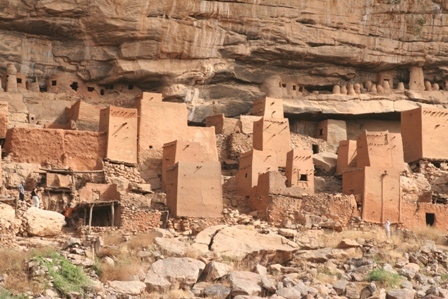 Today some Dogon villages are distributed along the top of the cliffs, others cling to the cliff edge and the rest are down on the plains at the bottom. They farm the land below on the plains (mostly millet). The clifftop villagers grow cash crops such as onions and hot peppers which they sell or exchange for millet. They are a self-sufficient people; ekeing out an existence in a very inhospitable place. They are totally dependent on the rains which fall from June to September, to grow their crops and collect water. They are either primarily Moslem, Christian or Animist. 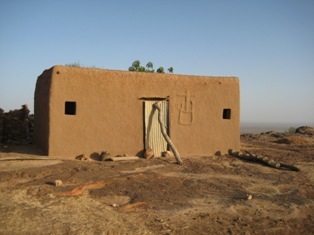 Families live in compounds made of mud brick. They containing sleeping huts, cooking huts and many granaries with funny thatch roofs that look like hats; set at a jaunty angle. 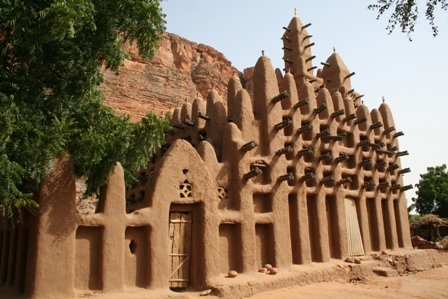 Villages contain mud mosques or Christian Churches, the animist villages have sacrificial sites where you will find monkey skulls and all manner of dead animals hung up at the Hogon house for protection. All villages have any number of fetishes outside the village and within the villages, to protect them from spirits, encourage rains, cheat death, among others. We hiked down the escarpement at dusk and arrived into the village of Kani Kombole, where we were ushered into a family compound and served up some nice cold beers. Life was going on all around us – the women were pounding millet for dinner, cooking fires were roaring, and kids were excitedly dancing for us. Cathal played a tune or two on the whistle for them. After a bucket shower and dinner of couscous and the ubiquitous ‘sauce’ of onion and tomato, we climbed up to the roof and went to sleep to the sounds of village life on a Saturday night. The following morning, after a surprisingly good nights sleep under the stars, we breakfasted well on baguette and farines, which are small donuts. We had brought our coffee pot, so treated ourselves and fellow travellers to some strong expresso to start the day! Coffee – thanks Caoimhe and Carl for the pot! We headed off at about 8.30, and walked 3km along sandy tracks to Teli. We had expected longer distances; but in the 35 degree and upwards heat, short distances were quite adequate. 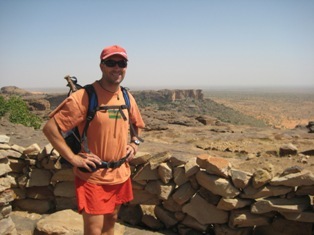 After a quick refreshing Coke, we hiked up the cliff to the old part of the village which nestles in the cliff. Above this we saw remnants of Tellem storage huts. 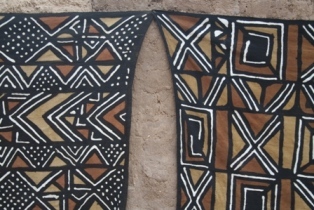 The Tellem existed in these parts before the Dogon. They used cracks and caves in the cliff to create storage, small shelters and burial grounds. One wonders how the hell they got up there! 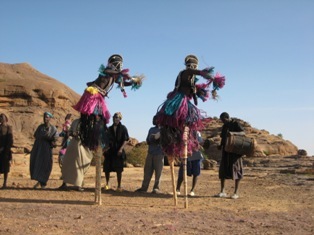 The Dogon believe they could fly!! After lunch we walked on through endless fields of millet stalks, always with the cliff to our left. We reached the village of Endé in time to visit the local market. 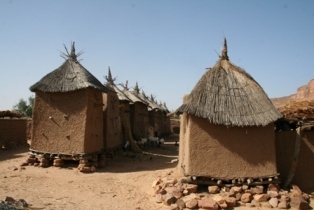 The Dogon week has just 5 days, and each new week is marked by the return of the travelling market to the village. It also serves as a communication system – merchants bring with them news of other villages they have visited. 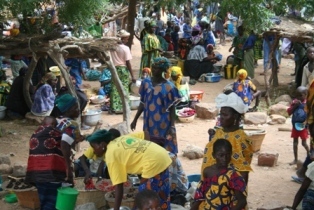 The market was alive with women trading and men sitting around drinking millet beer. 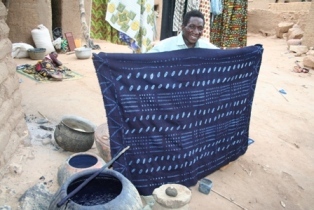 At Endé, we also saw how they made indigo dye for cloth, and the famous Mudcloth, where they use different colours of mud to dye cloth to make cloth. Every ingredient comes from the land – incredible! After a windy night on the roof, and thus not much sleep, we said good bye to our tzo American pals, as one of them, Joe, had fallen quite sick during the night. 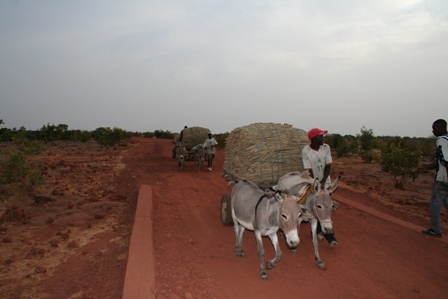 We waved them off in a donkey and cart, they were heading cross country to Bankass and on to Burkina Faso. We remarked it was like a scene from Bethlehem! We were sorry to see them go, they were good company and James was a mine of information on West Africa, having already spent a year in a village in Burkina. Cathal and I continued with Séydou on our hot journey. This morning’s trip took us through some villages that see few tourists. These were particularly interesting. People were going about their daily chores, smiling greetings as we went by. 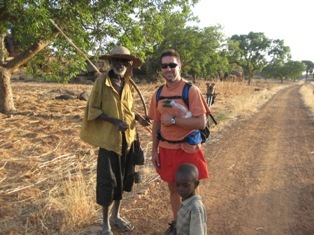 We had to give the obligatory cola nuts to the Hogon Chief of course. In these villages, the ‘male’ and ‘fermale’ granaries were particularly pronounced. The larger male granary holds millet grain for the family, and some valuables such as sacrificial altars, while the female one contains a mix of millet, beans, rice and maize, for the women to sell at market. The proceeds help to buy clothing for daughter’s weddings. 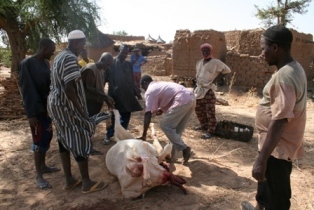 Slaughter of a cow. 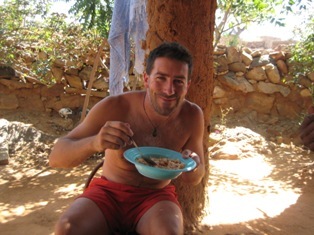 The meat is shared between the villagers, the rest is sold at nearby villages or at the nearest market. No fridges here to store meat! Every bit of the cow is used. Qll the men know how to deal with it – they were quick to get to work! After these villages, including a coke stop, we headed up the Falaise. 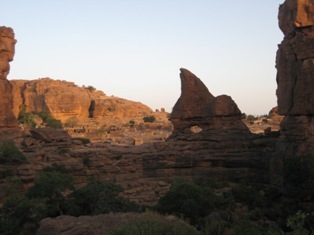 The Dogon have created walking routes using piled up stones and notch ladders to climb the sheerest faces. The views were stunning. At the top, we made our way to a small village for a well earned rest and lunch. 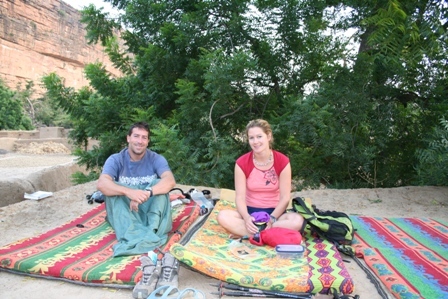 We parked ourselves for hours in the shade overlooking the plains. The village we were in was very traditional. We met a palm reader and had a great view of the village from a rocky outcrop. We walked just a couple of k further to Benigmato, our destination for the night. The rock shapes were stunning in the evening light, so dramatic. 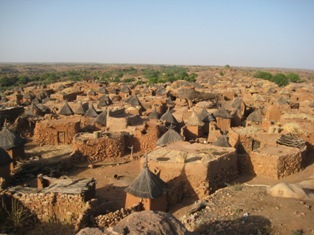 The village nestled amoung the sand-eroded shapes. We had a bucket shower as usual, and fell into our rooftop beds after dinner. We started the final day with a tour of Benigmato, a strongly animist vilage, as can be seen from the Chief’s house. 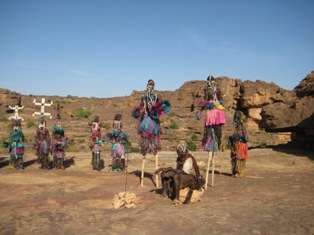 We also saw a display of masked dancing, which is strongly entrenched in Dogon culture. What we saw was a replica, as women are not allowed to see the real thing! Our final stop was at a village further along the cliff that is split between the top of the cliff and half way down. 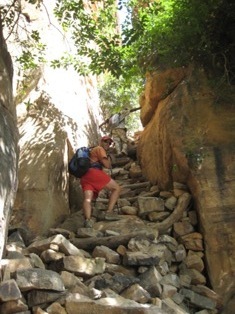 The villagers are slowly moving to the top, as there is no water supply on the cliff. 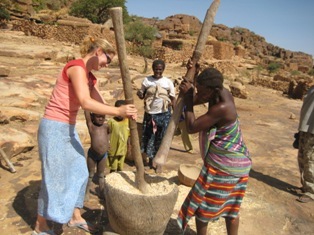 Jane helping to pound beans – hot and hard work! 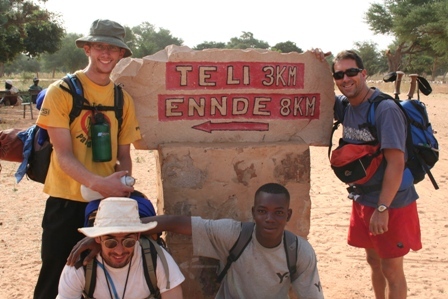 We shared a Peugeot taxi with some other hikers back to Bandiagara, and then took a wreck of a taxi back to Sevare. 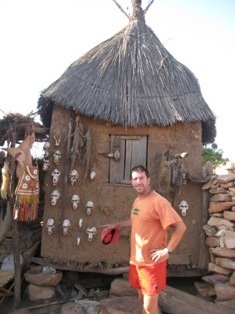 Overall it was a fantastic experience to visit the Dogon Country, to see first hand how a people can survive so well in extreme conditions. Wow, this is absoltely amazing. I dont know if you have seen the programme ‘Tribes’ with Bruce Parry but this is as good. Feel I have learnt loads. Bet you were glad to see a bed at the end of it? Great stuff guys. Chas, I hope you’re keeping those Coke bottles……. The sleeping hut on your second day reminds me a bit of the adobe huts in New Mexico. Caroline and I went to see a village there which is now inhabited really only during the day – has no piped water or electricity; so the natives go home at night to their homes with creature comforts over the hill. Cant remember the name of the place now (something like Tao…) but it’s pretty famous and they are trying to keep it as it was. Doesn’t souond like the folks you’ve been meeting have options like that. Horrifying statistics about HIV further back as well. You’re great at recording the names of the places! Hey guys! I finally found your site – better late than never. I must have misplaced the URL on the donkey ride to Bankass or sometime after. Anyway, I love the blog. Very well done. I never properly thanked you for the anti-nausea medicine either. It was a real godsend being able to keep some water down. It was slightly hot out as I’m sure you remember. Well, it looks like you’re still going strong on touring the world. I hope you’re having a great time. Shoot me an email sometime and take care of yourselves. Hey guys, this is Joe (the very same Joe from this blog). It’s been a while, but I have found your webpage. Better late than never as they say. It looks like you’re having an awesome time and have covered a large portion of the globe. I’m back safe and sound in Massachusetts and my next big adventure will be within the continental United States. I’m going to spend the first two weeks of July in Zion, Bryce, and Escalante National Parks in Southwest Utah. I’m really excited for that, Zion is supposed to be gorgeous. I don’t think I ever properly thanked you for that good old first world medicine that you gave me. It was great being able to keep some water down in that kind of climate. I would have been in pretty rough shape without that. I’m curious how the rest of your trip has gone so far so you should get in touch. Especially in the unprobable event that you find yourselves in Boston. I can be reached by any of the following. Am just beginning to catch up! It’s so nice to have a record of your travels. Places I’d love to visit. So who knows? Well done. Some of what you report relates to my experiences in Malawi in February 2008. So much need.